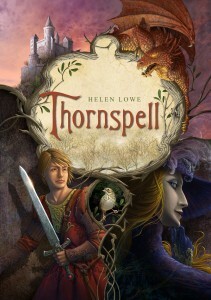 On August 1 I began “Fun with Thornspell”, in which I asked readers to tell me the Thornspell character they would most like to have a standalone short story written for, or about—as well as why, based on that character’s exploits in the Thornspell story. And I asked three judges, introduced here, to decide which character, from amongst the suggestions you’ve put forward, I would get to write a short story about—to be published here on the blog with a dedication to the selected commenter. “Well I would like to see a short story about Rue. There is a lot that could be said about her struggle against the Magravaine’s spell, and her efforts to help Sigismund while her own power (or most of it) remained bound and fettered by the 100 year sleep. “For a Thornspell short story, I’d like to see something with the Margravine (Farisie) and her sister, Syrica, the Queen of Faerie. Before the Margravine came to this world and created the Sleeping Beauty. Specifically Page 288-9 (hardback version)- an old sorrow. What got the Margravine started or helped her towards what she became? Hers is an interesting story. Staying hidden for a hundred years. Thwarting the Magravine’s plans despite the risk. Interesting that the two comments ranked 3rd equal were both for Syrica! And the overall top-ranked comments from our judges were for female characters. So there you have it: I shall be writing a short story about Rue, which I hope to bring to you within the next month to six weeks (as per my post of September 1.) I think it will need to be soon, before I get too wrapped up in writing Daughter of Blood (The Wall of Night Book Three), which I suspect may quickly become an all-absorbing project! Beth Miller: Beth Miller works at Writers House Literary Agency in New York, where she is the assistant to my agent, Robin Rue—and as such was amongst the first people out there to read and love Thornspell. She is also a writer in her own right; her first novel, Into the Scottish Mist, was published by Wild Rose Press in 2010 and you can read my interview with her here. Peter Fitzpatrick (Fitz): Fitz was another early reader of Thornspell and has been an integral part of my writing journey since he has designed both my Helen Lowe on Anything, Really and Thornspell websites, as well as designing the map for The Wall of Night series—for which he was nominated for a Sir Julius Vogel Award for Best Professional Artwork earlier in the year. Sharon Stogner: Sharon is an avid reader, follower of a number of blogs such as the Supernatural Underground, and a book blogger herself on the ismellsheep book and movie site. 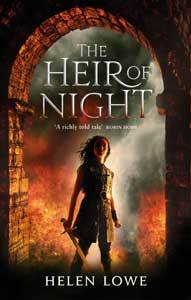 Sharon was also an early enthusiast for both The Heir of Night and Thornspell. Well all I can say is that “All credit to the other teams, but Thornspell (and me!) was the winner on the day”. I am very much looking forward to reading the new story.